I enlarged the photo and think I see what your talking about now. with the smaller photo I thought you were talking spacing between lfl and the copyright but it looks like the copyright may be deformed in yours. Is that what your referring to? If so that can be counted as an error and not classified as its own distinct variation. 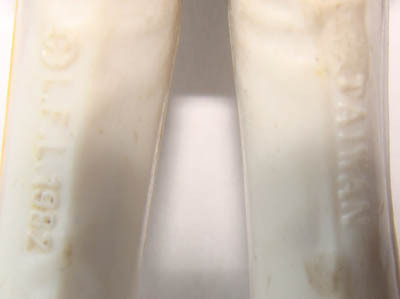 the plastic cools at different rates due to thickness and the coo symbol being thin upraised could have cooled and pulled slightly as the leg was ejected from the mold. It also could be a different coo altogether but as we don't have a new coo guide, I am unsure. I will look around and see if another place may show that coo, but the other site I am thinking of has an incomplete guide as well last I checked. Different capes, PBP cape has the leathery look, this one has the pitted look. PBP has the step cut, this one doesn't. Thanks Bryan, that would be tremendous. I can't tell in your pic if the right leg has Hong Kong or Taiwan. I have found a Taiwan coo figure that the left leg has this copyright where the c combines with the circle. If yours is a Hong Kong I would suspect a leg swap as I don't think the two right legs would end up on the same manufacturing line. The coo guide I was thinking of is even less complete than wolff's current 3.0 guide, so it wasn't any help. This site I linked does have some inaccuracies on it, so if you search through and find a wierd variant (I.e. bespin guard with white collar) then ask about it, as the variant may not actually exist. Hi, yes it’s a Taiwan Coo and looks like the one you found on highasakoit. Ta very much. I would like to give an update on the Darth Vader pictured above with the HON KONG coo. First, I'd like to thank Mat, Bryan, and Oscar for helping me identify this figure and point me in the right direction. I can't leave Tom out either. I thought it was pretty cool how helpful you were to someone making their first visit to the site. Thanks! On to the figure. 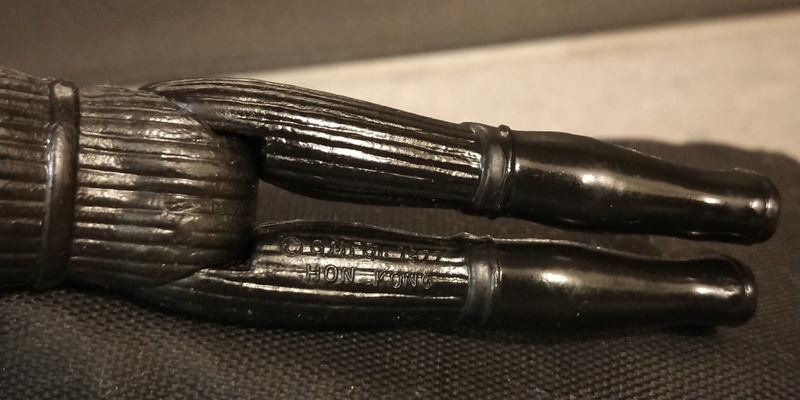 I was able to connect with Tom Derby and he said he has seen one other Vader with those markings. Tom believes it could be a pre production figure but unless we can tie the figure back to Kenner it is more likely an early production figure. After doing a little research it turns out I purchased this figure on ebay in August of 2016 from someone out of Massachusetts. I contacted the seller and he had purchased it from a private collection owned by Jim Conte out of Rhode Island. 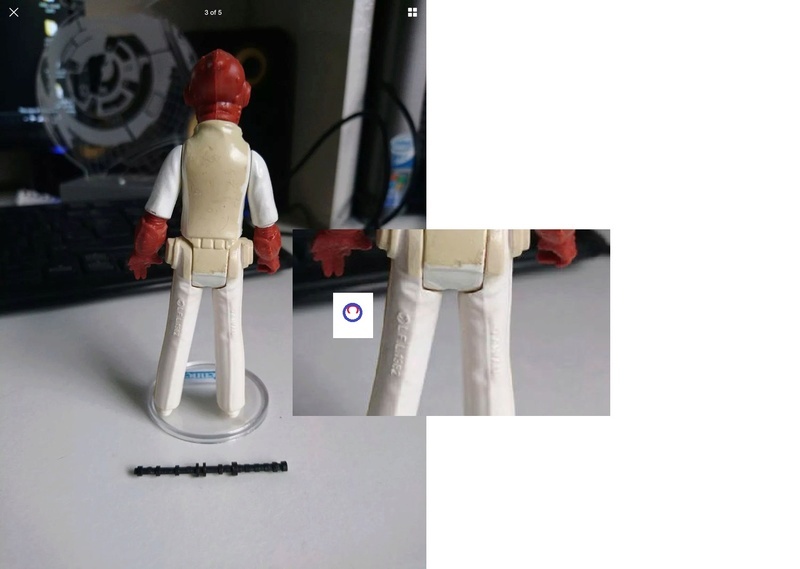 After reviewing the ebay photo I can confirm the cape and the unbroken lightsaber pictured above came with this figure. I cannot determine at this point whether the cape and saber are original to this figure. Tom could not confirm one way or another whether the cape was authentic or reproduction. It turns out this figure is quite rare regardless whether it is pre production or early production. However, the figure would be twice as valuable if I can tie it back to a Kenner employee. Cool. Glad you were able to get an answer of sorts. With no sure provenance, I agree you can't say it is preproduction but still fairly rare i guess. Out kf curiosity was the email I had for Tom still good? I don't need to contact him, but on occasion I point people his way so like to have current contact info. Btw, Oscar I am glad you commented again. I wondered since you had seen the previous pics and made mention of the cape specifically why you didn't mention the pbp. I should have put together that if it had been the pbp cape you would have recognized that. Yes, that was the correct email for Tom. The cape for this Vader has the texture on only one side of the cape. Is that consistent with the PbP capes or the cape pictured above? I assume Tom asked about markings on the bottom of the feet? Is there any? It doesn't prove anything one way or the other but I am curious if it has any. No markings on the feet. I have not removed the cape, would there possibly be something on his back? I just got a response back from the ebay seller. The cape and saber are original to the figure as far as he knows. This was part of Jim Conte's estate so it looks like my trail has gone dry. I have never heard of any markings being on the backs. I have seen some on the feet bottoms. Oh well, be happy you seem to have an early production piece. Cant call it preproduction, but to have a piece from early in the line is cool too. 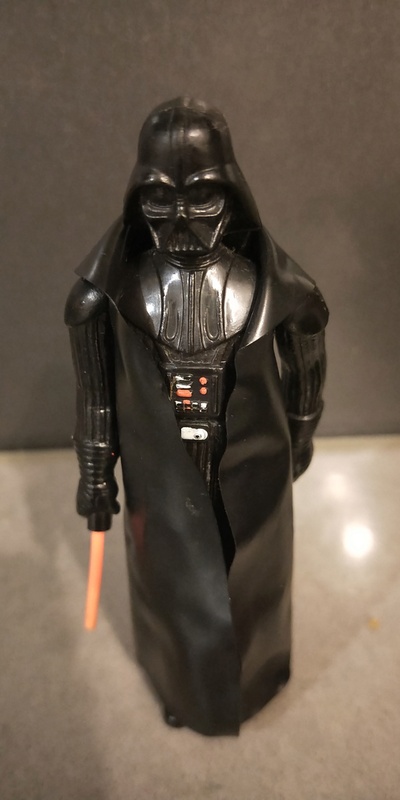 I don't know that it would have much added value since it is production but for a Vader focus or coo chaser collection this might be something of interest and I could see it going higher than others for that reason. How much higher though is anyone's guess. Glad it worked out in the end Sam, sorry I couldn't have been of more help. I enjoyed this thread cause it means another coo to track down. Tom thinks the value is in the range of $2500-$3000. Double that if I can connect it to Kenner. Wait, Tom called it an ep as in engineering pilot? Like a preproduction piece? Pretty sure that is what I was told ep stands for.....I will have to go digging into old messages now to make sure I have the correct terminology. Otherwise it is a production piece, and I can't see a production piece worth that much even with a rare coo marking. If Tom is saying it is an ep and CIB is willing to sign off on it, I would work on getting this piece authenticated and (as much as I hate grading) cased up by afa or however Tom is doing them these days. Without the direct kenner tie I don't see how he can say it is a preproduction item though, but maybe he has done some further extensive research showing this coo never made it to public release. Tom is not saying it is preproduction because of the lack of provenance. 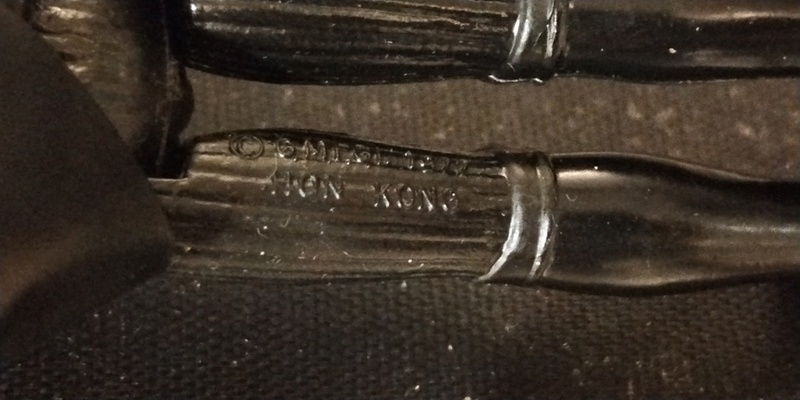 He said if he authenticates the figure it will just be listed as coo HON KONG. Because of the lack of history to this figure you have to assume it is early production. EP as I understand it means engineering pilot, Tom is not saying that even though it could be. With all this in mind it is still one of only two known figures with that coo. I suppose the cape could even be a prototype making the figure even more rare but it could just as easily be a reproduction. A great article to read by the way. Tommy did an outstanding job going step by step. Secondly, I will leave the rest here and say good luck. We know the cape is production, or at least believed to be as Oscar said he has several identical to it. 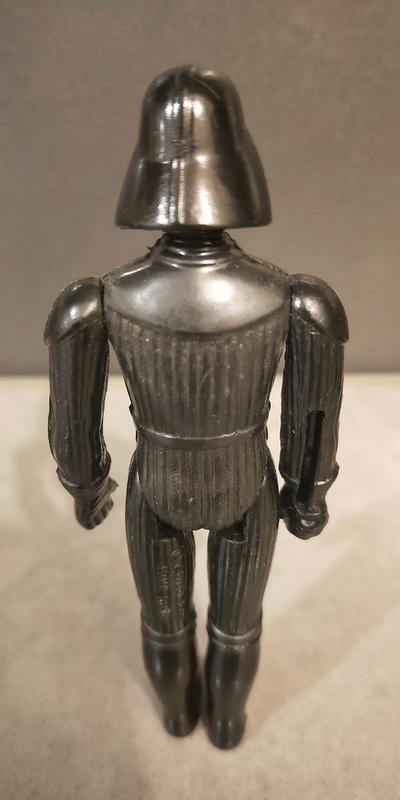 We also know it isn't one of two in the world as Oscar has seen one, and i linked an auction to one that in that link bill McBride says it matches 4 known at that time (believe he was talking figure not saber but only he knows). I will refrain from saying what I would price it's value at, but I do believe Tom is way off. A piece can't command preproduction pricing if it can't be certified as preproduction. And as far as rare coo pricing the only comparison we can draw is on one that is much more common or at least documented in the Taiwan only and even then it doesn't commonly break the $250 range. So while this may be a much rarer figure to throw out $2500 seems pretty far off base. Good luck with it if you do choose to go the sell route, but personally i would keep it as it is kind of like a small find that you were actually involved in. I'm really new to the more rare figures so I'm admitting my knowledge is minimal. That being said, isn't Tom an expert on the subject? He has made me an offer and it wasn't close to $250., add a zero and a bit more. Maybe he thinks it is preproduction even though we do not have evidence for it. Any thoughts? I am sure he does, I tend to lean towards preproduction also given the circumstantial evidence we see regarding it as such, however as an prototype collector would tell you; for ep figures, no provenance means no proof. As you can see from the article I linked ep figures were basically production figures that were used for internal things like testing. This means they are literally no different to production pieces except they may have some handwriting on them and can be traced 100% back to a kenner source as being used for those steps. If Tom wasn't willing to give a coa from cib saying it is an ep, then I dont see how he came up with the price he did. 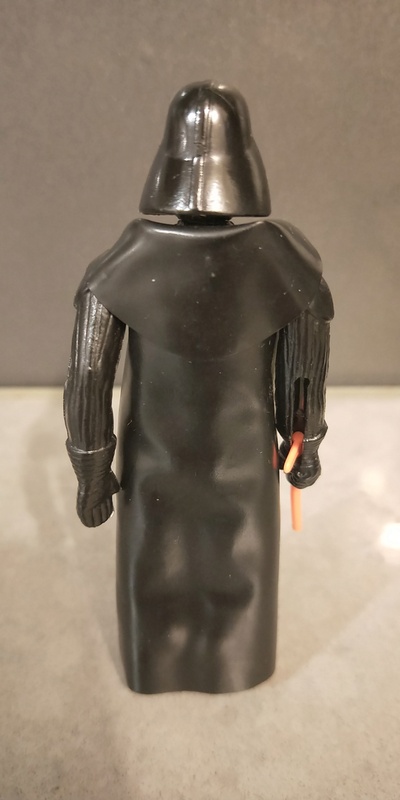 To put perspective on it, a year or so ago an ep Vader with a production saber was sold for $3500 I believe it was. And that was a rock solid ep piece. This is just a coo rarity with no kenner ties. 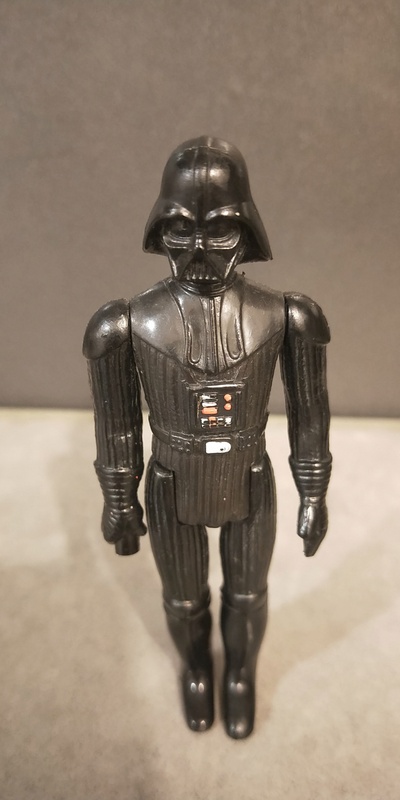 That same piece today would be more due to market changes, but again unless somehow this can be tied to a kenner source I don't see that value there. If Tom does though and you want to pass it on then again, good luck. I see exactly where you're coming from. I know this isn't proof and maybe it's common knowledge to the more experienced collector but here we go. When Kenner closed their doors in Cincinnati in 2000, many of the employees moved to Rhode Island to work for Hasbro. Jim Conte, who this Vader was acquired by lived in Rhode Island. Not sure if anyone is still reading this thread but I found I also have one of these 'Hon Kong' coo Vaders in my collection. I have no idea when/where I got it. I can post photos of anyone is interested. Sorry it's night here in Australia. I can take some photos in natural light tomorrow if anyone would like.